There is a local historical farm here that also rents spaces for community gardens. We are the proud temporary guardians of one of those plots. Todd and Millie go out to water and weed several times a week. Every once in a while they talk me into joining them. Of course Millie likes to help water (play in the water), help weed (play in the dirt and pull up anything green), and check out the animals - horses, goats and chickens. We also have a friendly robin who gets surprisingly close to us. At least, at first we thought he was friendly, now we think he's just protecting his much-loved munchies (the green beans). This is really our first garden. I've tried a few things in our flower beds in previous houses, but we've just never had the space to garden (hence the rental plot). We're learning as we go. Todd and Millie planted from seed (I was on bed rest during planting time and watched from a blanket). Next week we're going to have to buy some already started plants as the majority of the seeds are being less than productive. 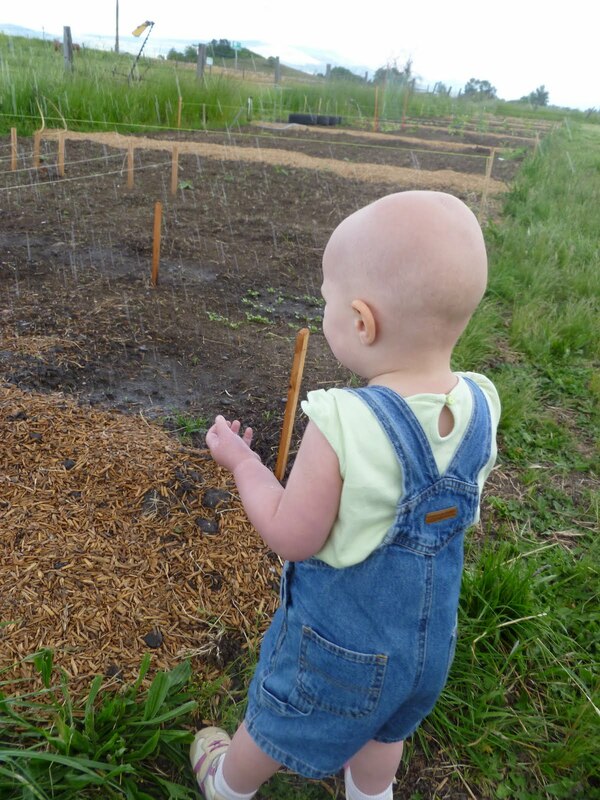 We're enjoying the garden and the farm though. It makes for some fun family time. In pregnancy news, I'm still pregnant! I'm 36.5 weeks, this is the day in Millie's pregnancy that my water broke. I keep waiting for it, but so far no puddles. I'm starting to really think I'm going to have a full-term baby this time! Hoping that means less of the problems we fought with Millie - namely breast feeding. On the sewing front I've been making more skirts and dresses for a couple of my mommy friends' little girls. I've been making simple elastic skirts and making up the dresses as I go along. They've been fun to make but I'm nearly done. Shipping them off later this week. My other in-progress project is making costumes for the kids to wear at my church's Vacation Bible School. I would love a garden! We have some flower pots on the porch and that's about it. I have a hanging tomato planter that I want to try but my mom said didn't work for her. We will see! I think you should win gallons of ice cream! That sounds fabulous!